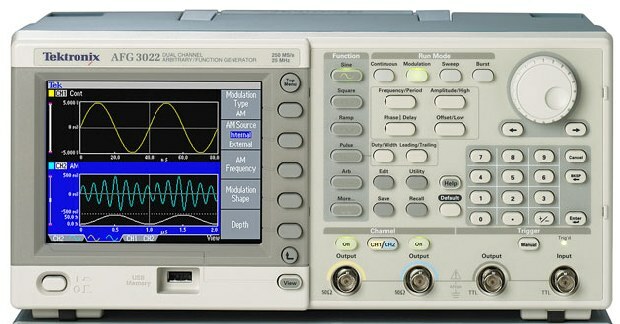 We’ve just released a long list of new features in MATLAB Answers. Here’s a rundown of what’s new and what’s changed. 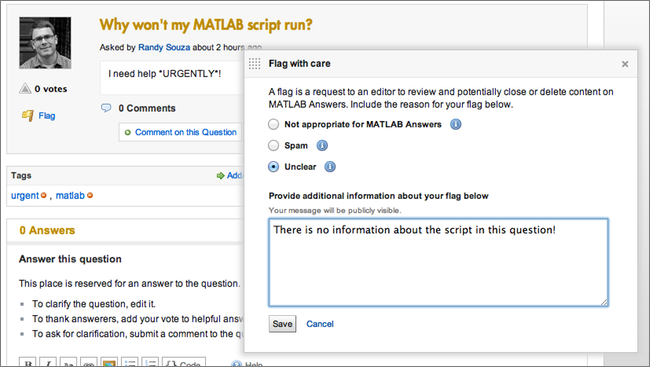 Since MATLAB Answers launched you have earned reputation points when someone else accepts your answer or votes for your answer or question. We rewarded contributors who earned 1500 points by making them editors. Our 11 community editors have helped curate questions and answers by editing content for clarity and deleting anything inappropriate. Starting today we’re expanding the number of privileges you may earn and distributing them based on finer-grained levels of reputation (the existing editors are grandfathered in and retain all privileges). You can see the available privileges and which ones you’ve earned by visiting your MATLAB Answers profile page. Here’s a shortcut (you’ll need to be logged in to your MathWorks Account): https://www.mathworks.com/matlabcentral/answers/contributors/me. 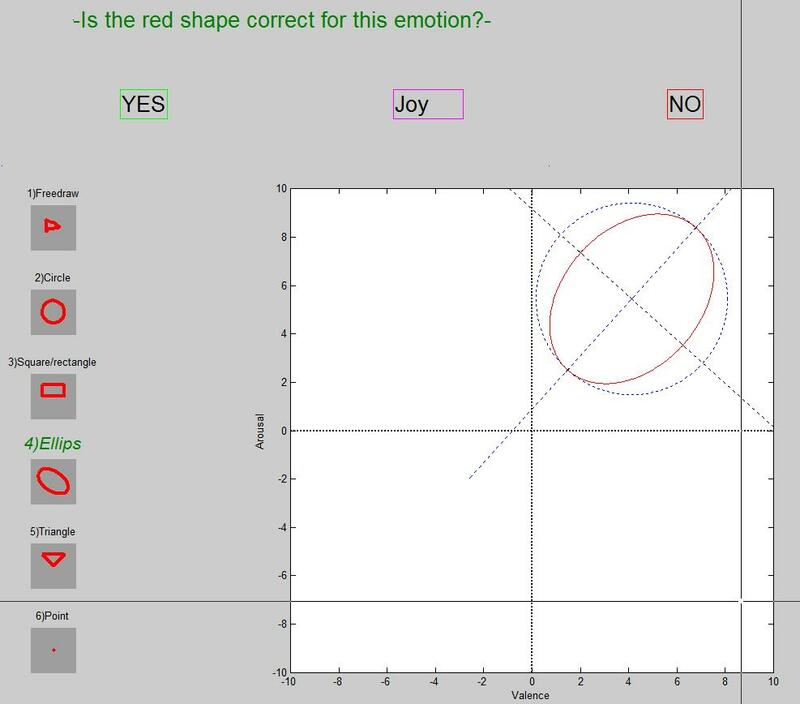 While we appreciate all of the questions asked on MATLAB Answers, some of them are challenging to answer. Some questions don’t include enough detail. Some questions are bald-faced requests for the community to do the asker’s work for them. To supplement the community-maintained tutorial on asking good questions, we’ve added the ability to flag and close questions. 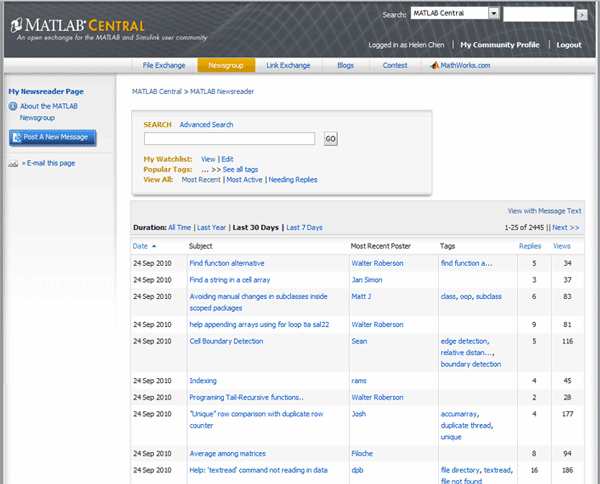 Any logged-in contributor may flag a question, answer, or comment for review (flagged content is visible here). Contributors with sufficient privileges may close questions. When a question is closed it is removed from search results and cannot receive new answers. The asker receives an email letting them know that their question was closed and requires improvement. Closed questions have two potential fates. If the question is edited it is reopened and behaves like any other question. If the question is not edited for ten days it is deleted. We also hope to improve question quality by making it harder to ask bad questions. 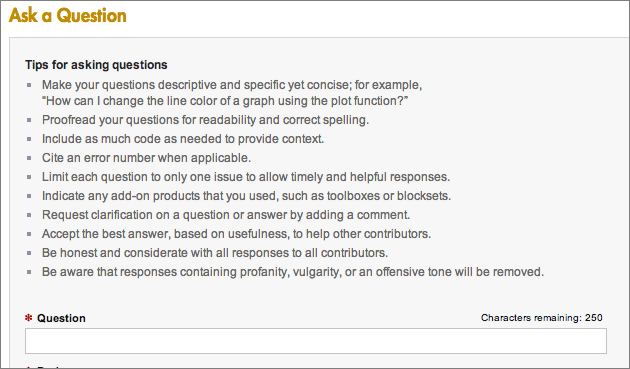 We’ve added tips for asking questions to the ask-a-question form (you only see them the first time you ask a question). Additionally, from now on questions have to be at least four words long. Ned’s trend shows that while most questions receive an answer, very few of those answers are accepted. We think that accepted answers are important—they provide recognition to the answerer and help future visitors solve their problem. So we’re allowing contributors with enough reputation to accept an answer to any question, once the question is 7 days old. We added MATLAB markup to comments, and added the ability to edit your comments. We added an “all activity” view, useful if you like drinking from fire hoses. We added the ability to disable the MATLAB Markup live preview. We tweaked the meaning of “latest activity” for questions—it now updates when a question is closed or reopened, when a question is edited, when an answer is added, or when a comment is added to a question or answer. We exposed direct URLs for answers and comments (click the icon). We’re very excited to get these new features out, and look forward to working with the community to fine-tune how they work. Please add your feedback by commenting on this post! I noticed your "Tips for asking questions" didn't include "Upload an image, screenshot, picture, or diagram that illustrates your question and will let people better visualize your problem and develop an answer" -- I guess it's because you don't have such a capability (yet). When is that coming? I was pointed to this blog when I was seeking information about what the Flag means in MATLAB Answers. If this blog is the main place to look for this sort of information, perhaps a link to it should be provided in 'About MATLAB Answers'. Opinion: Recent activity (eyes in the sky) is creepy. Now everyone will know what I vote for!! Okay. The eyes in the sky are really cool for watching what others are doing but not so cool that they can watch what I am doing! I was waiting for a feature which allows to browse and upload the image directly on the forum. It is still required to upload the image on a third-party image hosting site and link it to the Question/Answer. And after some days it results in situation as here... http://in.mathworks.com/matlabcentral/answers/24769#answer_32539 When this feature is coming? Maybe it is not suitable to put the question to here. I have a question about the comments, like this: https://www.mathworks.com/matlabcentral/answers/41876-why-arrayfun-does-not-improve-my-struct-array-operation-performance After I accepted the answer, I add some "Comments" to some of the answer. Does these warmhearted person can receive prompt about my comment and have more discussion? And there would be better "unaccepted the answer" to "Accepted answer" if the questioner find another more suitable answer.